The Royal Bafokeng Sports Palace is a rugby union, football (soccer) and athletics stadium in Phokeng near Rustenburg, South Africa. The capacity of the Royal Bafokeng stadium was increased from 38,000 to 42,000 to be able to host four first and two second round matches at the FIFA World Cup 2010 South Africa. 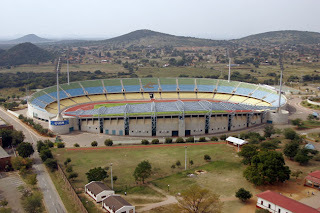 Royal Bafokeng Stadium plays host to the round one Group C match between England and the United States on 12 June, 2010. For 2010, the main west stand was substantially upgraded and enlarged and given a new cantilever roof at a cost of US$45million. Other improvements include the installation of new electronic scoreboards, new seats, and the upgrading of the floodlights and public address system.